The blackberries were starting to ripen on the bushes lining the gravel road that leads to our neighbors’ house. I noticed the smell: warmth and dust on sunlit berries under blue skies. We often go back and forth to each other’s yards, the kids jumping on the trampoline or sliding down a small plastic slide into a waiting plastic pool, the adults talking and standing by to kiss scraped knees. This was a weeknight dinner, another part of a continuing conversation. When we climbed the stairs to their patio, we found a new face at the table. He sat at the end, his legs crossed like a folded piece of paper, his hands in his lap. He rose to greet us, with a firm handshake and a small voice. Our neighbor introduced him  the neighbor from across the way. She had told me the day before that his wife of almost 70 years had died 2 months before. It was his 89th birthday, his first without her. Of course she invited him for dinner. What do you say to someone you don’t know? Someone whose beloved wife has died? Someone who wears his grief on his lined face and in his shaking hands? Is it rude to ask about her and how he is living in her absence? Is it rude to not ask about it? I looked him in the eye and said hello. Happy birthday. The table was laid with newspapers spread out over each other. I looked down to see the police blotter from the island: smashed mailboxes on a side road, a bicycle stolen, a prank phone call. There were cherry tomatoes from the garden, slices of lemon, some gluten-free crackers. Corn dogs for the kids. Cheerful daisies and purple rhodies. And in a big red bowl, Dungeness crab our neighbors had caught in their traps the night before. It was a crab feast. We all reached in to fill our plates. He looked down at his hands. And then he looked at me and said thank you. He started to talk about it and the anger spilled out of him. There was something about the doctors and a step-daughter and people taking over control and somehow politics became involved. I couldn’t really follow what he was saying. I nodded. I felt like he just needed someone to listen. We all did. I asked him a few more questions about it but he seemed to have talked himself out about it. I didn’t want to push. I said again how sorry I was. The conversation shifted to how our neighbors had caught their crabs. It wasn’t as big a catch this year as summers before but they still had been pulling live crabs from their pots every night. Their fingers grew tired of being jammed by bits of shells, late in the evening after the kids were in bed. They wanted us to eat the crab instead. It was the first time our neighbor had ever eaten fresh crab out of the shell, on his 89th birthday. The kids got up, weary of the adult talk, and began playing on the steps. Lu and her friend picked up the toy rifles waiting there and started playing bad guys. He told us about the weeks of marching with the army up to Belgium, fighting until the Nazis surrendered. He remembered the summer in Paris, driving around senators visiting from Washington D.C., appalled by their drunken evenings. He waited to hear if he would be shipped out to Asia. He recalled his relief when he heard about the atomic bomb detonated in Hiroshima, because it meant he wouldn’t have to fight in Japan. And he told us how he met his wife, who had been in a concentration camp for years, in the streets of Paris. They fell in love and they had lived every day together since, until she died two months before. I wanted to know more. I wanted to know about her experiences but I didn’t want to push. At that moment, one of the kids walked into a pointy bit on the toy rifle and started crying. It missed his eye, thank goodness, but there was a gush of blood and everyone rushed into the bathroom to clean and console. When we returned, everyone bandaged and calmed, our new friend folded his napkin on his lap. “Well, I’d best be going,” he said. He had left a tidy pile of empty crab legs and the cracker next to it. There was an awkward moment of silence as we all stood there, wondering what to say. All I could think was, He’s going to shuffle back to that empty house and settle into the silence by himself. I didn’t know him, really, but he had shared dinner with us. I didn’t think. I reached in to give him a big hug. He hugged me back, the two of us standing there for a moment, connected. I wanted to invite him to dinner at our house every night. I wanted to invite him to move in with us so he wouldn’t have to sit in a silent house. But he clearly wanted to leave. So we all hugged him again and watched him slowly walk down the stairs, headed toward his empty home. A few moments later, we all headed into the kitchen, to lean against the counters and try to talk about what had happened. A wave of sadness washed over us all. There wasn’t much to say. And then the one-year-old, smiling and moving like a drunken sailor, walked for the first time between her father and mother. We all cheered for her and she grinned as wide as that sky outside the window. I don’t know what to say about this, really. I mean, I could say a lot about that evening. I have. I’ve erased it all. If it had not been for that crab, those crackers, those spread-out newspapers, I would not have heard that man’s story that evening. I’m so grateful for that food. Thank you so much for sharing with us. I have tears in my eyes. I think you said the right things for that sweet man!! Sometimes listening is the best. Everything you write has such a palpable beauty to it. This is no exception. I hope this man finds some peace in his wife’s absence and knows now that he has friends in all of you. All we have in this world are our stories. Having the ability to be present and hear others stories is a gift Shauna, a real gift, better than anything else you will ever receive. I know you don’t think you know what to say but you did exactly what he needed in that moment and you captured in perfectly in this piece. We are lucky people you and me to have evenings like this. The intimacy resonates deeply in me and I am grateful you shared it with us. Oh and the next time I have a dinner party I am totally using newspaper for the place settings!! What a beautiful story. As a Stephen Minister, we often work with people who are grieving. You did exactly the right thing. Keep listening, stop by to check on him, expect that it will take time and he may never fully recover from the loss. Too often in our society, we think people should “get over it” quickly and move on when all they really need is someone to listen. Food does bring people together. I lost my partner of 10 years to a hit and run last month and the grief is still raw. One of the things that keep me going on is cooking for people who have been so kind to me during that time. And don’t worry about not knowing what to say. The listening is enough. Just being there is. And of course, food always helps. Eunice, I just want to say – from across the void that is the Internet – that I honor your grief. I am so sorry for the loss of your partner. Something in my heart spurred me to reach out, so here I am. You, and your partner, are in my heart. You may not have known what to say, but what you’ve written captured it perfectly. And I am crying, by the way. I love the juxtaposition of his leaving and the one-year-old walking – the alpha and omega experience that always seems to tie these quiet moments together. Somehow linked. Wow. Thank you for sharing. And I hope you can share more food with him to bring more folks together. Just wow. Thank you so much for sharing that, I have tears in my eyes. It amazing how someone’s life story can affect us. I hope he finds some pleasures to help him enjoy the rest of his life, everyday is precious. I lost my mother this spring. It has taken the wind out of my sails. My father is alone for the first time at age 82. I spend much more time with him now that he is alone, often over a meal. My mom cooked homemade meals for him for nearly 57 years. She shared her love of cooking with me, but not so much with my dad. My dad has floundered with the meal preparations when he’s not invited out or eating with one of his grown children. He asked me yesterday if I had a “beginners” cookbook. My 82 year old father wants to learn to cook! The love of good food and cooking that my mother shared with me is something I now look forward to sharing with him. Sometimes we need to talk about something beside*gasp* my mother’s sudden diagnosis of cancer and death, the gaping hole that we now live with and the things we still want to or need to tell her. I think cooking and food preparation (and eating!) are going to be great ways for us to create a “new normal” for my sweet dad. And, a way to honor my beloved mom. I love your idea of a new normal. What a beautiful way to honor your mom and connect with your father. Wishing you the best! Thank you for sharing such a beautiful story! Food truly does bring us together. I have all those neighbors down there I do not know thanks for sharing some of it. There was I time I could not comment and now it shows up twice. SIlly. Gluten-fee girl, you simply rock. I loved your postings when I first stumbled upon your blog several years ago and I love them now. Your musings are beautiful and heartfelt and you should always keep on writing. God, yes. Yes. There aren’t really words to say “my soul feels this with you, with everyone.” The way that tragedy and new joy all live together in the same space? How is it even? Again, like I always say, thanks for this. Beautifully written, Shauna. You have many voices — your inner voice; your voice for speaking with friends; your teaching voice; your voice as wife and lover; your voice as one of the best mothers I’ve ever met; your voice of awe, wonder, and discovery; your writer’s voice; and many others as well. I love the way you bring them all together, a bit here and a smidge there, taking the best of each, writing it all down to discover for yourself the essence of whatever you are writing about, and then letting go of the chaff until your story and feelings are pure and true and shine in the light. Thank you for sharing your evening, and for viscerally making each of us a part of your life. I know a lot of people that never even talk to their neighbors. Just think of all of the missed connections, the stories lost through the cracks. Thanks for posting this. My parents are elderly and difficult. I dread the day when one is gone and the other is left behind. This makes me more inclined to be generous of spirit in that instance even though we do not get along. I literally (and I don’t mean that in a Saturday Night Live kind of way) cried while reading this. Thank you. This story brought tears to my eyes, the good kind. Thank you. That was a beautiful story. Thank you for sharing. Sometimes the best thing to do in those situations is to say less, listen more, and show compassion. Sounds like you did all three. I was not expecting this at all..I’m glad you posted that experience with us all. My own father turns 85 tomorrow and this will be his first birthday in all his adult years without my mother present. Needless to say, he will be at my own home for his fav.dinner and his birthday “pie”! It too is hard for him to go home to a lonely house. Be grateful each day! You all gave this man something he dearly needed..a compassionate ear, company and something new on his birthday that he won’t have to remember it just as the first birthday without his wife and a hug. A very special gift you all shared together and that you shared with us. Sometimes when we don’t know what to say, all we need to do is listen. Thank you for sharing this. Wow! 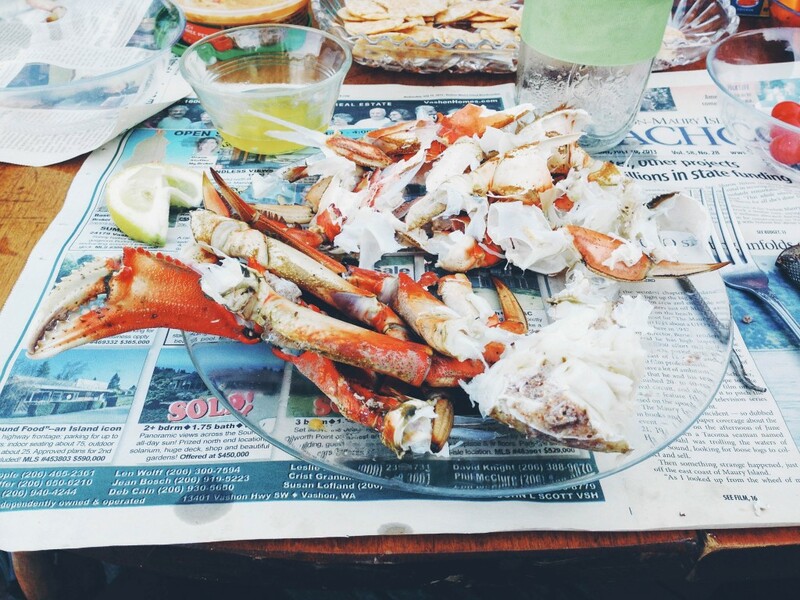 My heart aches for his loneliness at the same time my stomach growls for the crab feast….. Thank you for sharing this and making me stop to pause & appreciate the loves I have in my life. You make me want to cry every time! Food does bring us together. and i, for these words, this story. This is precious. As I sit here crying, I ache for that connection he had with his wife. It’s a gift to be part of an experience like that. To share in a loss and feel it reminds us of our humanness and the complexity of our life experiences and the importance of connecting and touching another’s life. Someone once (can’t remember) said, The shortest distance between two people is a story. Thank you for sharing your beautiful story about his stories. I hope that the people at the dinner continue to connect with him in the days to come. He has so very much to offer. My goodness, I am completely overcome by your post. We lost my father-in-law the day after Christmas this year. He had just turned 90. Like your neighbor, he had been in the war, found love after, and then lost his wife (my beloved mother-in-law). He lived as a widower for 7 years. My dear daughter (10 years) adored her Grandfather. The connection to the past is an amazing thing. I hope that you encourage this relationship with your own child. He is not a relative of course, but for someone to span the centuries as he has is quite the experience. And I can only imagine how the light from a sweet child will change his days. Your comment reminds me of a wonderful children’s book entitled Wilfred Gordon McDonald Partridge by Mem Fox. A must read. Thank you. Stories and moments like these are just so rich in love and loss and sorrow and much, much emotion. What a wonderful story, it made me smile 🙂 and I always love eating fresh crab! What a beautiful story. It brought tears to my eyes. What an incredible writer you are. “food brings people together” – Never have truer words been spoken. This was incredibly powerful. The power of shared food – literally and figuratively breaking bread – is immense. A very touching heart rendering story. I’ll bet this gentleman has many a wonderful story to tell. If I lived there I would invite him to dinner once a week, and maybe the other neighbours could do so as well. Then he would have something to look forward to. It won’t take away his grief, he will still have to deal with that but at least he would have something to brighten his day, as well as feeling a part of the community. And what a loving community you have. Thank you for your words and for your kind presence in the world. Your stories and your thoughtfulness are such a gift to so many of us. Yes, if all of you at that dinner continue to invite him to come eat with you once a week or so, the Community you build will teach Lu a great deal about how to live. The opportunity to care is all around us, if only we take a moment to notice. Thank you for reminding us. You are amazing! Thank you for that very tender and very vulnerable moment and for sharing it with me. Again, your ability to tell a story has made me cry. What a beautiful gift you have. By the time I was done reading this, the tears were trickling down my cheeks. Please let us know if you have future encounters with him. I wonder if it’s possible for those of us spread out all over to somehow lessen his loneliness. Although maybe he’s not so much lonely as lost without his partner, his other half; I’m not sure how much the internet community could help with that. That was lovely, Shaunna. Thank you. You said just the right amount. The gentleman was very fortunate to have you there….and you learned from him. Does it get any better than that? That was beautiful, Shauna! I learned from my years working with a local hospice that people want to tell their stories. Not asking abt someone’s loved one b/c we are afraid of opening wounds is common — but most times, the antithesis of what people need. I always have to screw up my nerve to acknowledge someone’s painful loss but have never yet not had them be grateful for the chance to share memories or just enjoy a momentary sense of camaraderie. Truly, we are all in this together. I ache for him, too, and I don’t know him. I love how you reached out to him in so many ways in over a meal. Thank you for sharing. Thank you so much for sharing this gentleman’s story, it was so beautiful.You have a kind heart and a gentle spirit, so of course you used both to help. You told him you were sorry for his loss. You encouraged him to talk about his life during the war, and showed eagerness to hear what he had to say. You gave him a hug before he left that evening. Your friend helped my inviting him to dinner. The two of you gave him a chance to step away from the pain for a short while. Caring is comfort. Sometimes the simple things are the most powerful. Bless you both. This was very meaningful and beautifully written. See, even toy guns hurt..Why do we still let our kids play with guns?! So very sad this story. We went up to the memorial dedicated to all the servicemen killed since WWII. The most chilling thing which reduced me to tears (an unusual occurrence) was the vast acreage of wall still blank – where future deaths would be commemorated – a greater area than that covered so far. I will post my feelings when I have fully taken it in. Thank you, Shana, that was beautiful. Oh, does this even matter or should I have to say it? If you don’t know what to say… don’t say anything. Just don’t ask. Don’t pry, don’t prod, don’t push. Even by asking, one automatically creates a sense of obligation for the person to respond. Not everyone wants to talk about their loss, especially so soon. It’s not our job to help them “process” it by “talking through things,” but to wait, watch, hope, and pray, and listen when they have come to things at the right time. Let it come about naturally. Perhaps someone who has suffered a loss or is grieving would prefer not to be reminded of that loss, not to have to talk about that loss — for, of course, they think about it all the time. Grievers know, as soon as they leave the house, that their grief is evident on their face, and even when time has passed, they still wonder if it shows in the lines, in the shadows, in the wear. The day that a griever can walk out the door and know that they don’t have to face a barrage of well-intentioned but intrusive curiosity will be a good day. my favourite post thus far. Thank you so much for sharing this! My great-uncle was wounded on D-Day, and never spoke a word about his experience in WWII… I was told to never ask him questions about the war, which is unfortunate because so many stories were left untold. The chances are so incredibly slim, but wouldn’t it be something if your neighbor and my uncle knew each other then? You said the right things. You let him talk about her, his beloved wife. My husband died quite suddenly and very unexpectedly on February 5th, 2013. I long to her other’s stories of him, to hear his name, to hear more about him… to talk about him and remember. For me, a young widow with a young man of 14 to continue to raise I don’t have quite the same loneliness that your neighbor does. I am sure that will come some time in the future when our son is married and starting his own family… and I am left completely alone. Staying busy has it’s good points and it’s bad points. I don’t want to squelch the grieving process… to have to deal with all this some other day. But it is hard to cry so hard… so often… to live without my right arm… my love. I was thinking to myself as I read the part about that it “was not her dying, it was the absence”, and was overcome with emotion. To lose your best friend and have that connection severed suddenly made much more sense. I am glad that he was there to celebrate his 89th birthday with everyone. There is something so magical about food, people, and the openness that is shared around a table. Thank you for this reminder. Shauna, thank you (as always) for sharing your stories. The writing & the message are touching every time. It’s a way to bring those veterans back to DC for the day to tour the memorials. Preference is given to people like your new neighbor friend. That’s a wonderful group. They flew my father-in-law back to DC a couple of years ago. When we see our neighbor next, I’ll ask him about it. I loved everything about this post! 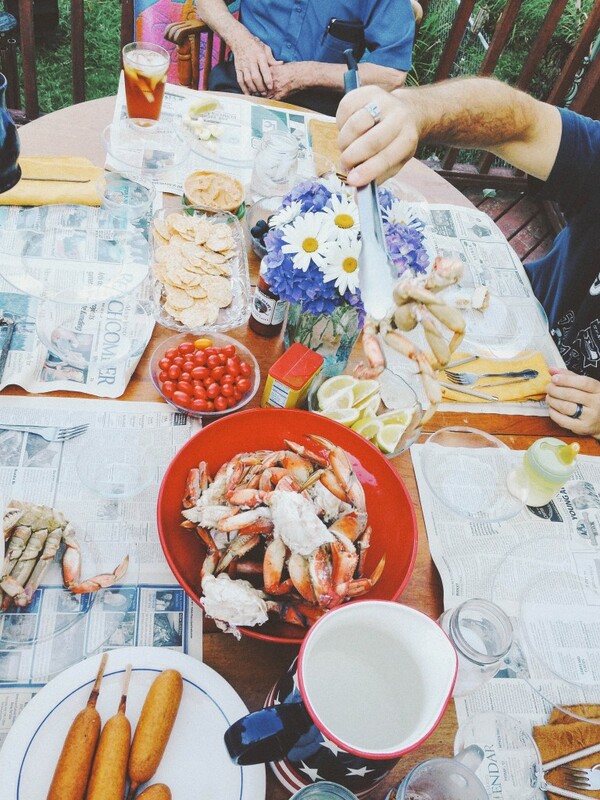 Especially the crabs … living out in California we will overnight Maryland Blue crabs out here for special occassions!! I just stumbled upon your blog for the first time as I’m just starting to take on the journey of making changes in what I eat in hopes of better health. I expected great recipes; I did not expect this. Thank you for your sharing of this moving story, for your beautiful prose, and for making me stop and think about more than just WHAT I’m putting in to my mouth, but with whom. You are quite simply an amazing writer. Your stories show so brilliantly how food really is the stuff of life on so many levels. Thank you for sharing this story. It doesn’t matter that you didn’t know what to say. It matters that you tried. That you said Happy Birthday. That you shared your food. That you listened. That you gave a grieving man a hug. My heart goes out to your neighbor. I know this place he is in. My husband, who was 46 and an avid cyclist, was hit and killed by a drunk driver 3 months ago while he was out on an easy training ride. He was my soul mate and my best friend. We were together for over 23 years and my life does not make much sense without him. I can only imagine how your neighbor feels after loosing his wife after 70 years. For me, the loneliness is often more than I think I can bear. Unfortunately, most of my neighbors think I have a contagious disease. It’s awkward, of course, and they don’t know what to say or what to do. And so they say nothing. And they do nothing. I have yet to be invited to dinner. I am sure being gluten-free, actually paleo, scares them even more. Sharing a meal with your neighbor is perhaps one of the kindest things you could have done. I have been told that this kind of loss will take a long time to heal. So, I hope that in the coming months, you will continue to share your food and your beautiful heart with your neighbor. Perhaps there will be muffins made with the blackberries collected from the side of the road. Or perhaps your daughter will read him The Princess and the Frog. You are beautiful gift to this man in this moment and I am sure your kindness will help him heal his broken heart. Carrie, I am so sorry about the loss of your husband. My goodness. I wish I could give you a hug. If you are anywhere near Seattle, will you email me? We can feed you and we would love to feed you and listen to your stories. Big hugs from here.